Young children experience the world in a completely open minded, fascinating, strange and magical way. But as they enter adulthood, the magic fades and consensus reality becomes the only reality. Monsters in the dark were merely products of the imagination. Or were they? In my case, abductions by Gray aliens were frequent during childhood. I also endured equally terrifying ghost and demon encounters. It got to a point where all through my kindergarten and elementary school years, I slept in the corner with my back against the wall, lights on, stereo playing story-time cassettes, desperately awaiting daylight. It became evident to me that otherworldly beings existed, they could show up here in the physical, they could get me at any time, and my parents were powerless to do anything about it. So, my reality was defined as utterly strange from the very beginning. I was too inquisitive and logical to let school and university dissuade me from acknowledging what I had personally experienced. Consequently, my later years didn’t involve redefining of reality so much as expanding and clarifying what I already suspected. True reality is very different from consensus reality. The latter is a kind of collective delusion held together by the limitations of our five senses and the decree of materialists. On the one hand, scientists acknowledge that our mundane material world arises from a deeper quantum world that is far weirder and more expansive in its possibilities. They recognize that physical reality is a subset of something bigger. Yet they scoff at possibility of this bigger reality ever showing its face to us. Then they lament that we are alone in the universe while ignoring all evidence that we are not; to a fish, every cup of water looks empty. 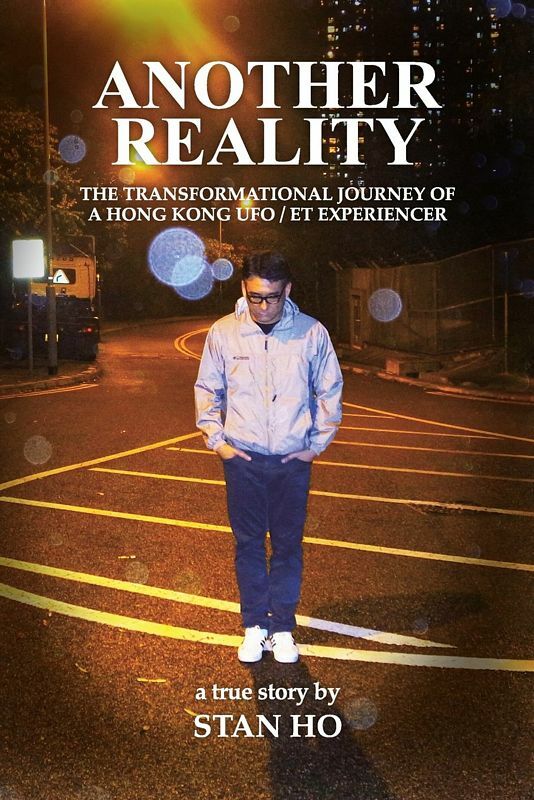 Book Review of Stan Ho’s "Another Reality"
This autobiographical book, written by Stan Ho, is dedicated to Stan’s experiences with UFO’s (Unidentified Flying Objects) and ET’s (Extra Terrestrials, or Aliens) all based on real life, truth, and fact. It covers topics such as encounters of various kinds, lucid dreaming, remote viewing, orbs, and consciousness. The book has several forewords, where one can get a base knowledge of understanding of exopolitical matters. This field is heavily based on testimonies, historical records, and intense research. Through these methods, we’re able to discern fake news, conspiracy theories that have no base of facts, and collaboration with others who are on the front lines of working with the people who matter in this field. It was good to see so many forewords from the people who have really made a difference. When we deal with subjects that are not widely known about, or are shrouded in uncertainty, mystery, and controversy, we must first attempt to educate our readers so we can help guide them into these realms. Stan has done a good job in laying down this base of information which makes it much easier to understand and digest the subject matter. Time, Space, and all things that exist in it are connected, this connection is known as synchronicity and will be mentioned on numerous occasions. It’s important to understand its meaning because just understanding what it is, helps us to make sense of what’s happening around us, now, in the past, and in the future. This is all related to Quantum Entanglement, which sounds incredibly complex (and it is), but it’s made easier to understand for us here, at least in a way that helps us relate to it. Read more: Book Review of Stan Ho’s "Another Reality"
Any individual who enters this field of research brings with him a set of beliefs with boundaries for acceptance or rejection. This is naturally based on the individual's level of comfort and openness with accepting any of the weird information dumped into his naive hands. 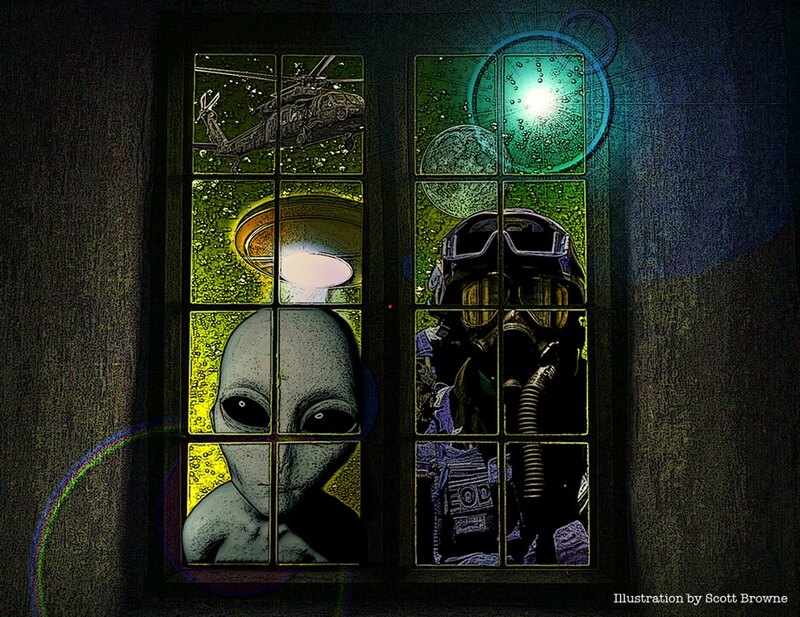 UFO researchers have been fairly willing to accept a generous portion of this bizarre data but always retain a personal, often private, preference for the amount of "weird stuff" they are willing to accept as credible. I am constantly amused at the notion that a researcher of incredible abductions by aliens in UFOS could label anything as "too weird." Yet, as human beings, it is our nature to "draw the line" somewhere based on our need to provide a sense of comfortable order to the chaotic and bizarre influx of strange information. It seems to take a great deal of personal maturity, security and ego-strength to publicly acknowledge and willingly support some of the data which others label as "too crazy." Our boundaries do shift and expand over time as we become more at ease. History provides an important perspective on the shifting boundaries of belief and disbelief. Decades ago the first hurdle surpassed was the basic acceptance that UFOs might actually exist in our earthly skies. But to believe that they could contact the soil or land under intelligent control was absurd, at least until enough odd soil samples and credible witness reports forced an acceptance of this possibility. Then it became unthinkable that people could claim seeing little beings in conjunction with a landed craft. Even crazier of course would be the idea that such beings would overpower humans with paralysis and float them aboard for exams! But look at how our collective boundaries of acceptance have stretched over the decades of research into this endless jungle of weirdness. This is basically due to the endless flow of new cases which, when researched carefully and methodically, are today considered as more reliable, credible, acceptable, and also supportive of data patterns from previous decades. On the horizon are issues of genetic manipulation, spirituality, channeling, multiple dimensions and paranormal correlations. Most of these areas of interest are presently viewed as "too weird" or "without scientific foundation," which is what James Pringle, a prestigious British scientist, claimed about reports of meteorites in 1759, until a wealth of data forced acceptance of "rocks falling from the sky" within the next 100 years! Everybody has a sense of self or sense of personal identity, and our sense of self is perhaps the most valuable human part of us. Psychologists defines "sense of self" as the way a person thinks about himself and views his traits, beliefs and purpose in the world. Beyond the basic need for a sense of control, we are more deeply driven by our sense of identity - of who we are - than any other part of ourselves. As Descartes said, "I think, therefore I am." Our sense of self includes the roles we play in life, the attributes, behaviors and associations that we consider most important about ourselves. And our sense of self is always changing as we learn, experience and grow. For example, I am a therapist, a sister, an American, a friend, a Buddhist, and much more. Each of those are descriptors of me that function together to manifest the person I am, that give me confidence and a sense of security and help me create a life that is happy, rewarding and worthwhile. Sense of self is an essential element of human personality. A strong sense of self creates confidence and the ability to move forward, meeting life's challenges. It is the foundation that underpins our ability to function in an often difficult and formidable world. When our sense of identity is challenged, even the strongest among us can feel powerless it can cause confusion and a feeling of loss. Or, in other circumstances, it can open our eyes to new possibilities and expand the boundaries of our hearts, minds and lives. If an individual is ready for it, seeing another aspect of who they are can be a wonderful thing. Read more: Who am I, really? You might say that the human-ET contact story is a mystery inside a paradox wrapped up in an enigma surrounded by a black hole inside a bigger black hole. I think anyone who has spent time studying the phenomenon will agree. After all the years of research and investigation, about the only thing we really know for certain is that there are still more unknowns than knowns, and of all the unknowns, the one that seems to pique our curiosity the most is the identity of the beings who are taking us. In all contact events, that seems to be the first thing we always want to know. The Earth is populated by a vast array of plant and animal life, and at this point in our evolution, humans are the most technologically advanced species on the planet. However, as advanced as we are, admittedly, we're not advanced enough to pull off anything seriously resembling the phenomenon that has been conceived of, organized and perpetrated by alien visitors on Earth since before recorded time, and neither are any other life forms on Earth. So when we start asking who is taking us, the answer is pretty clear - it's either ETs, humans or, according to some experiencers, a combination of both. Read more: Who Took Me? Could megalithic stone circles be used for alien communications? What if megalithic stone circles were electromagnetic receptors for alien telecommunication? What if they are still been used for this purpose? 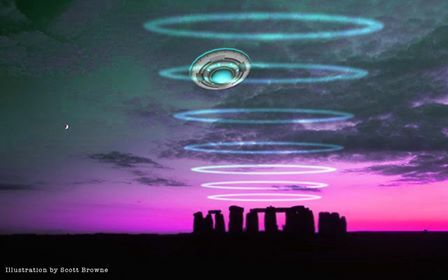 This article presents evidence suggesting that ancient stone circles may have been used as electromagnetic receptors for alien communications similar to what is known today as satellite antennas. This evidence corresponds to anomalies of radio and microwave radiation found in the center of the Mitchell's Fold Stone Circle, United Kingdom. Could megalithic stonecircles be used for extraterrestrial communications? The idea that extraterrestrial individuals were in contact with ancient civilizations was introduced in the science fiction narrative at the beginning of the nineteenth century (see for example Wilkins, 1946). Later on, this idea was popularized in the 1970s as a formal hypothesis by Eric von Däniken in his book Chariots of the Gods. This author offered arguments suggesting that a number of remains and narratives related to ancient societies (e.g. megalithic remains, miracles of the Bible, ancient Baghdad electric batteries, etc.) were associated with extraterrestrial technology (Von Däniken, 1973). Nowadays the hypothesis of extraterrestrial contact with ancient civilizations is referred to as the Ancient Astronauts Theory and has attracted the attention of a number of investigators who claim that evidence supporting this theory can be found in archaeological remains, ancient art and iconography, among others (Dennett, 2008). For example, it has been argued that the Nazca Lines of Peru were a type of alien airport were alien spaceships landed and took off (Mason, 2009; Rutkowski, 2010). Read more: Could megalithic stone circles be used for alien communications? 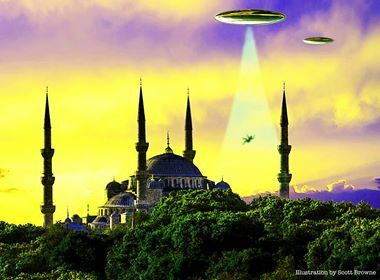 Turkey is no less enthralling than any other country in the world in terms of the frequency and nature of abduction cases, even though close encounter stories get most mainstream attention in the Western World. Contrary to the “relatively liberal ways” they have been reported in the West, reports of UFO abduction phenomenon have been made from around the country through “more secure channels” due to the conservative social fabric that discourages people from sharing their outer-worldly experiences. Through a comparative analysis of nearly 800 cases reported to us (Sirius UFO Space Sciences Research Center), physical evidence and corroborative testimony, we can easily conclude that almost every common characteristics, such as feeling of paralysis, the perception of having been transported immaterially (frequently through a beam of light), missing time, unusual marks, bright and oval-shaped examination/operation rooms, examination tables, unconventional medical procedures, removal and/or insertion of reproductive material, implants, balls of light, short and tall greys (Greys are most popularly associated with abduction reports. ), Nordics and reptilians (in rare cases) etc., seen in abduction cases around the planet are perfectly present in a plenty of stories with enough clarity to be labeled and archived as “possible close encounter case”. At this point, I need to emphasize that –in contrast to common recognition- majority of abductees in Turkey report vivid, detailed accounts without hypnosis. On Friday 28 April, the website was successfully moved to a new server. Because of this move, the site was not accessible for some hours. Fake news has been getting a lot of attention recently. 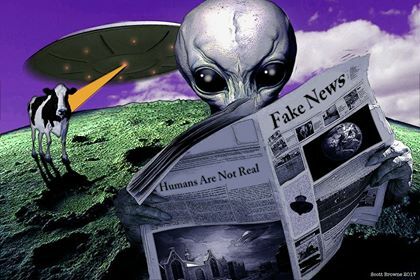 Anybody active in the fields of ufology, exopolitics or contact research, is of course very familiar with the phenomenon, as fake news stories have been rampant for ages in these fields. After all, the vast majority of video clips and photos with UFOs doing the rounds on social media are blatant hoaxes. There is plethora of websites that make a lot of money by constantly spewing sensational but made up stories that deal with an extraterrestrial presence. There are con artists pretending to be whistleblowers who are willing to share their 'exclusive information' for a 'reasonable price.' Then there are people with a genuine interest who think their piece of the puzzle is all there is, and muddy the waters by systematically dismissing and attacking any information that doesn't match their views. There are people with agendas, and there are paid disinformation agents. In these circumstances, finding the truth increasingly becomes a major challenge. To dispel some of the falsehoods that are being spread, we asked the members of our panel what they thought was the biggest myth or fake news story with regard to an extraterrestrial presence. Here are their replies. The biggest or most important IMPLICIT myth / falsehood that is being spread with regard to contact experiences is that a validating feeling and coherence with our previous beliefs is the surest way to judge whether information about the nature and purpose of extraterrestrials is true. Believers and skeptics are typically divided by gut feeling and by whether any information purported to be true coincides with their feelings and belief systems already engaging with their sense of personal identity. In an era in which greater degrees of precision, more careful and well-reasoned research and facts are mixed through new media outlets with "alternative news" and "post-truth" statements also vying for people's responses, allegiances and support, issues such as extraterrestrial and/ or interdimensional contacts (themselves already in the periphery of what is acceptable by the 'mainstream') can be subject to even greater disconnection from facts and from what can be plausibly said to be more correct and perhaps partially verifiable. This situation demands even greater clarity of method and critical thinking so as not to fall in the "fake news" pattern that many are willing to admit as "valid" or as "fact" because it resonates well with them. 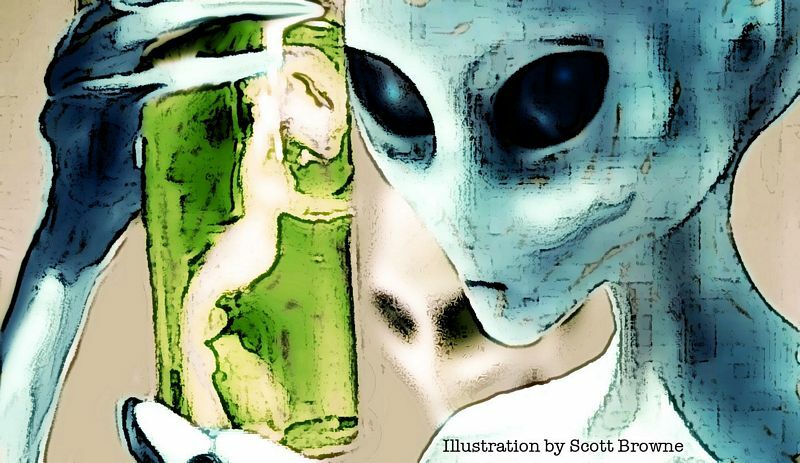 Deciphering genuine cases of extraterrestrial contact may well require greater degrees both of critical thinking and greater degrees of intersubjective openness.